After downloading the 10.0.3pre-beta of TenFourFox, I've noticed that video playback of html5 content in YouTube, on my PowerBook G4 15" 1.5Ghz, has gotten horribly slow. What has happened? It used to be slow on first playback sometimes, and really smooth afterwards and sometimes on first, but now it's slow and choppy no matter what. Is there something I can do to remedy this? Or should I just forget it and wait for a new update of TenFourFox? I can see no difference between 10.0.2 and 10.0.3pre on my G4 1.33 GHz. Which version are you comparing to? That said, Mozilla has repeatedly changed the priority of audio vs. video. At least one of these two will be stuttery no matter what if you don't own a multiprocessor G5. Right now, it's audio over video, meaning audio is smooth, video is a slideshow. Which I find easier to live with because my eyes are more tolerant than my ears. I'm using a slightly faster PowerBook G4 and I compared it to 10.0.2, and I had far superior playback of html5 content, in fact I found that using Safari 5.0.6, the latest version for PPC macs, and html5 video plays smoothly, no matter what the resolution, even HD plays very smoothly, I'd say 95% smooth. How then, when TenFourFox is supposedly optimized for the PowerPC's velocity engine (ie: AltiVec), a browser that isn't optimized for it (Safari), can beat in html5 video playback? Weird. Let's see if others experience slowdowns as well. TenFourFox plays WebM, while Safari plays the H.264 version, so they can't really be compared. Also, and that's the real difference: Safari's H.264 playback is hardware (GPU) accelerated. This is something we can't match. The only chance for hardware acceleration is using the QuickTime Enabler Extension (QTE) which sends the video to QuickTime Player. Thanks for the link on the add-on. Here's to hoping this gets fixed. Also have a look at the „Native video playback is too slow on my Mac“ in the FAQ. very interesting, I've read that before and have forgotten about it, funny how things slip from the mind. In any case My CPU is definitely faster than 1.25Ghz (it's 1.5Ghz). From another standpoint, I tries the QuickTime Enabler Extension and found myself unable to use it. Any thoughts? By the way, I've enabled plugins, but only use the QuickTime plugin, and have disabled all other plugins including flash. It doesn't matter if you have plugins enabled or not. Right-click anywhere in the page. Just not, on Youtube, the video itself because the html5 player or the flash plugin will both replace the standard context menu with their own stuff. 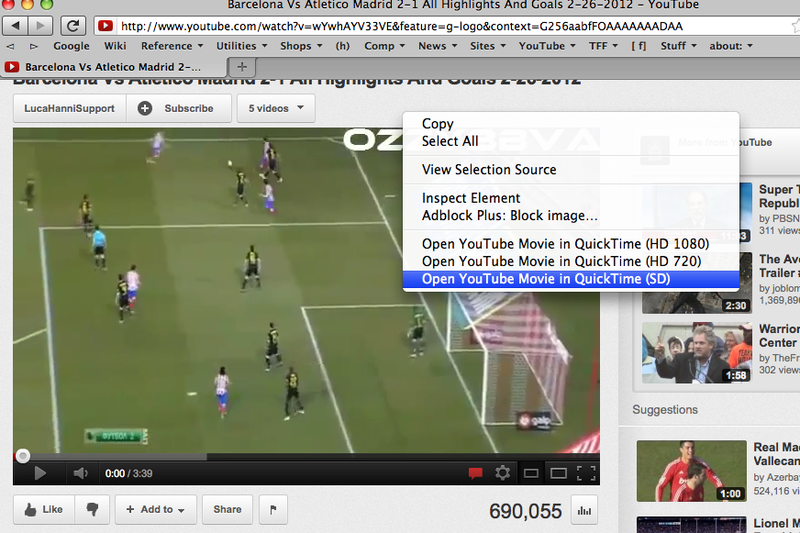 Select "Open YouTube Movie in QuickTime", or "Open Media in QuickTime" on any other website. hmmm, well, I suggest we find a way to make webm playback faster on these machines, and it's possible, CorePlayer a shareware video player for mac intel/powerpc, uses vector processing for the h.264 codec and other codecs, and it plays 1080p HD video on mac with at least a 867Mhz G4 CPU!!! No joke. And webm is supposed to be faster than h.264, so... what gives? I for one, will learn to program more (me ish an amateur), and will download the TenFourFox Source code to make webm faster on PowerPC. I will support this project and I hope to become a fellow contributor soon. To insert the benevolent dictator's view, I'm well aware that native playback is suboptimal on G4 systems (even considering that the 7450 is an 11-year-old-design). You should have seen it before all the AltiVec code went in -- compare against one of the early 4 betas. I can't see a difference on WebM playback on my iBook/G4 1.33 between .2 and .3pre (I tested this before shipping the change). The change is that the WebM decoder is allowed to use x decoder threads, where x = number of cores. Before it was only allowed to use one, even on multi-processor Power Macs, although some of the load could run on the other cores. Now it can open extras, up to four on the quad, but a single processor G4 will still just have one. 1.25GHz is the number at which G4s will almost all do badly, but upper range G4s are all over the map. I have users who are delighted with the performance at 1.33GHz, and others who get slideshows at 1.67. It seems to be a factor of the particular Mac and whatever else is running. Most G5s can display WebM with little issue, so G5s are the recommended systems. I expect the G5's much faster FSB is part of the reason it does much better even at similar clock speeds. WebM has absolutely no hardware support, and on Power Macs, it never will. Moreover, Firefox/TenFourFox isn't "just playing a video." It's converting it to the page colour space, scaling if needed and compositing it against the other HTML elements. Although we have an AltiVec path for it too, this is much more work than CorePlayer needs to do, which a) is using a hardware-accelerated codec that the video card handles much of the grunt for (H.264) and b) just needs to display it on the screen, which can also use the graphics card to blit the image. This is also why the QTE exists. VP3 (Theora) video doesn't have as many problems as WebM because it is a lighter codec. VP8 is actually pretty wacky to decode. Overall graphic performance could be improved by using the 3D card to do compositing, but Mozilla requires NPOT textures, which is not supported by OpenGL 1.2 in Tiger (and only a minority of cards support 2.0 in Leopard, for that matter). Mozilla themselves don't support GPU compositing even on Intel 10.5 due to OS bugs. If you run Firefox on an Intel Mac running 10.5, it's software, just like us. The long and short is, we can only squeeze so much out of the CPU. We're actually the only browser that uses libvpx's AltiVec code, in fact -- they took it out of their tree in 0.9.5 and we put it back and maintained it ourselves. I still encourage you to contribute, and if you find something I or the others have missed, file an issue and put the code up. I have users who are delighted with the performance at 1.33GHz, and others who get slideshows at 1.67. It seems to be a factor of the particular Mac and whatever else is running. Thank you all for your help on this matter, I've truly learned a lot in these past three days. As for H.264 being hardware accelerated, well that's true only on Intel and AMD machines, PowerPC has no support for this, because Apple didn't build it into QuickTime, and GPU acceleration is a no go on PowerPC, even on the G5. Apart from that, do you guys know of any other AltiVec code libraries, apart from libvpx, and if so, can you provide a link and a description to them, as well as a link to libvpx? This would be much appreciated, and any tips on vector programming will be much appreciated. P.S: I used Obj-C/Cocoa, C++, and php, so if you can provide info on vector programming on these three languages. Not true. Apple has been using GPU acceleration for a long time in their private frameworks, which Safari definitely leverages (http://xbmc.org/davilla/2010/05/03/osx-gets-h-264-accelleration/). Even the original AppleTV did this, which ran 10.4.